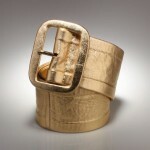 I don’t just consider belts an object of necessity, but something that could be fashionable and beautiful. I love studded belts. 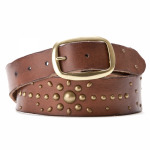 My first studded belt was purchased from Calvin Klein’s Outlet at Woodbury Commons, New York. 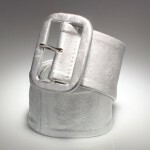 It was for a time, the only belt I wore with all my denim. Studs, simulated crystals, and an iridescent orange leather… I’m sad that the pretty iridescence is beginning to fade so for these past two years I’ve been on the search for alternates. Too many companies make studded belts that aren’t compatible with denim loops. Why? I’ll never understand. It wasn’t until I found Linea Pelle that my many hours of fruitless online browsing was rewarded.